It’s hard to believe that 3 days in the Grand Canyon warrants 2 full posts, but it’s true! There is so much to see and do – no matter where you turn, it’s a new view with new colors depending on where the sun hits the canyon. 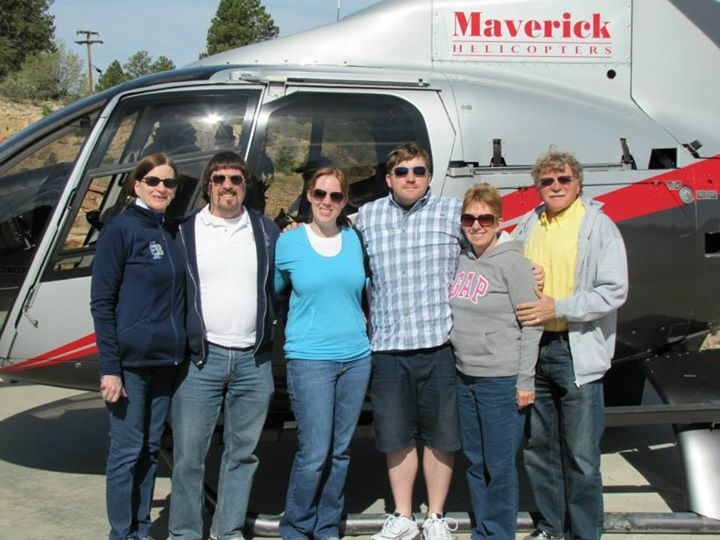 In addition to spending a day hiking** around the canyon’s rim, we also managed to fit in a jeep tour and a helicopter tour. By the way, there are a ton of pics in the post, so KEEP SCROLLING! **By hiking, I mean sticking to the mostly-paved pathway which winds itself a breathtaking, yet safe, distance from the rim. Remember I mentioned the ill-fated mule ride? We decided to do a Pink Jeep Tour after a recommendation from an awesome friend. 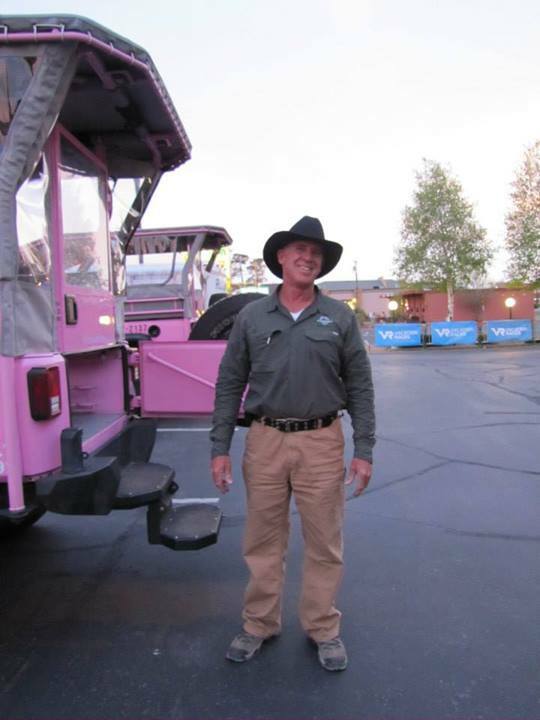 He saw Pink Jeep Tours in Sedona when he was on vacation and came back to tell me all about them. We were able to hop in an open-air Jeep with the whole fam and 2 new friends to see some of the less-traveled areas of the Grand Canyon. 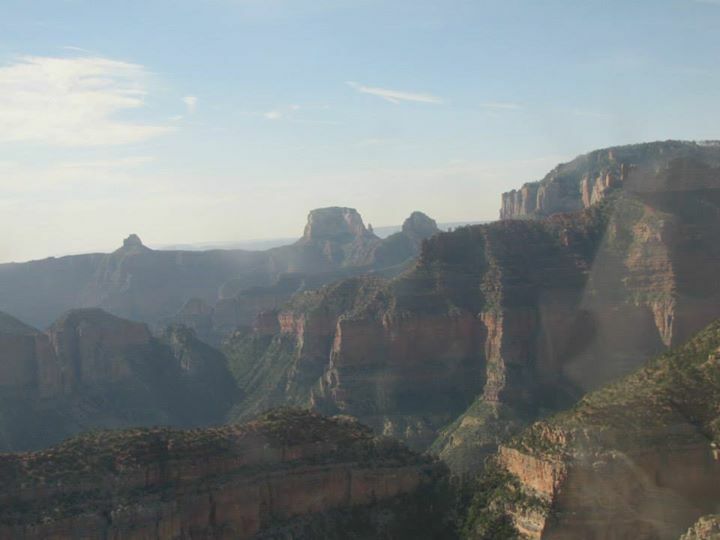 I have no idea where we were (maybe the east side of the south rim…) but it was absolutely gorgeous! Mike, our driver, was so much fun, so knowledgeable, and even let us gallivant a little longer than usual. 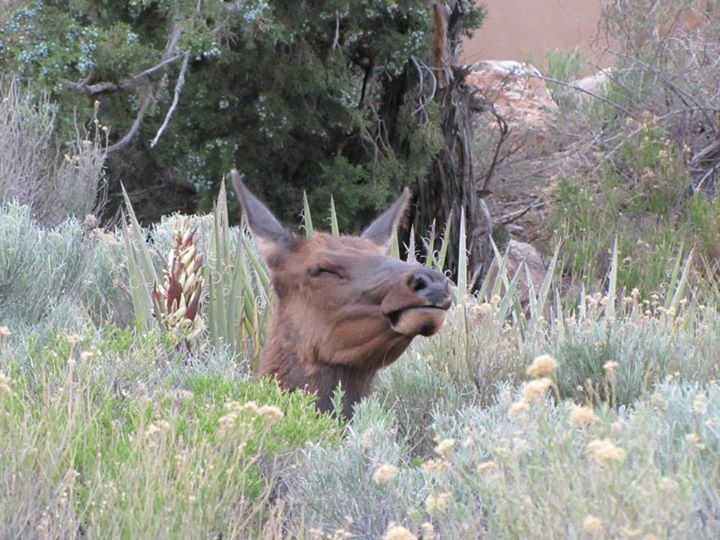 He also indulged my quest to find elk – and we found 2! 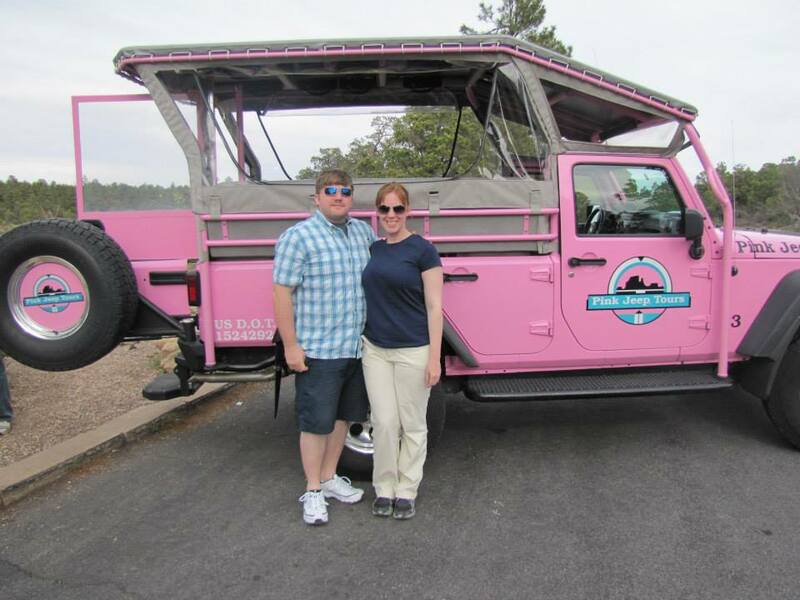 If you ever have the chance to do a Pink Jeep Tour – whether it’s at the Grand Canyon, Vegas, or Sedona, it is well worth it. Consider this my verified recommendation. Matt & me in front of the Pink Jeep. The whole family was there, but there wasn’t a good picture of all of us. A young male elk – I stalked him for about 20 minutes to get this shot. He was very nice about it. 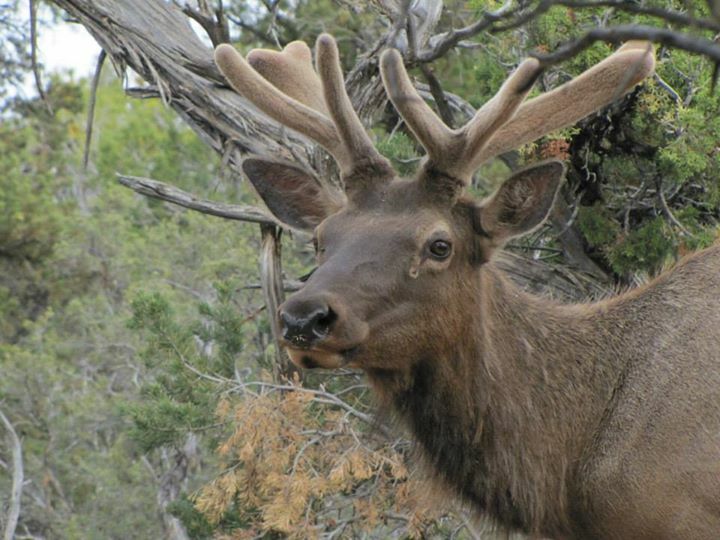 A young female elk. She was kickin it in the brush by the restroom… just loving life. 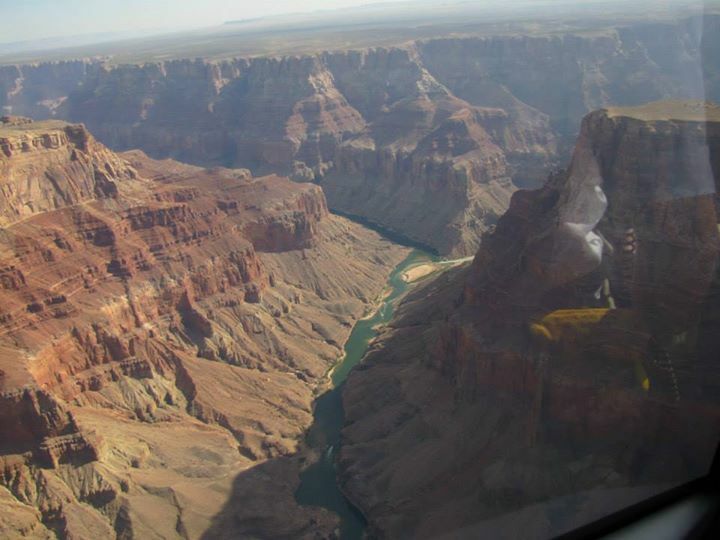 After another recommendation, we took a chance (an expensive chance) on a morning helicopter tour over the Grand Canyon. Bennett, our delightful pilot, played awesome music (Def Leppard, anyone?) and told us some incredible facts about the canyon. We opted for the earliest tour they offer because we were told that once the sun comes up, the canyon can get hazy which doesn’t make for the best views or pictures. With about 5 minutes left in the flight, the sky got hazy and we could no longer see the mountains in Flagstaff (which is really far away!). 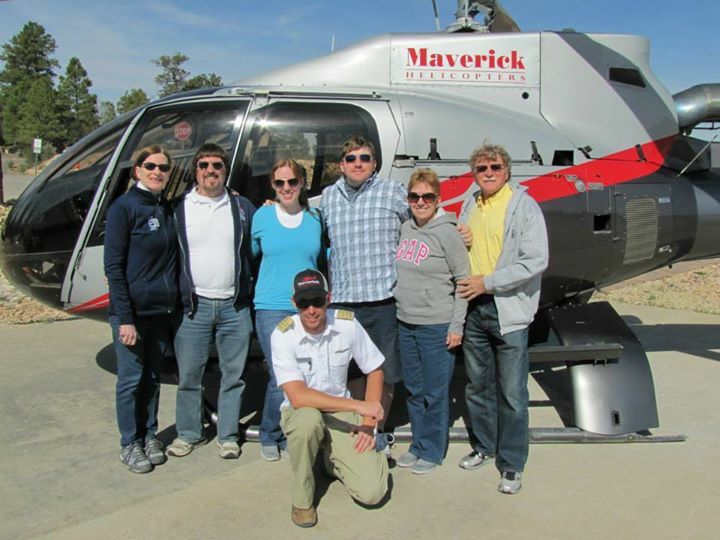 We looked at a lot of helicopter tour companies, but Maverick got some of the best reviews and came personally recommended. Now, I’m personally recommending it to you! Bennett, our pilot, with everyone! BeLIEve is a magic show by the illusionist and escape artist, Criss Angel. He had a show, MindFreak, for many seasons and most recently, he has his show, BeLIEve. Matt, Robin (my mom-in-law), and I have been big Criss Angel fans for years. I even had the pleasure of seeing this show in 2009 when I came with a college trip. Since that ’09 show, I’ve truly believed in Criss Angel’s talents as both an illusionist and as a magician. Yes, magic is real (Hogwarts could be a real place, but us muggles just don’t know!). Robin’s had a crush on Criss for many a year now, so it only made sense that we sit front-row-center for the big show. It was well worth it. 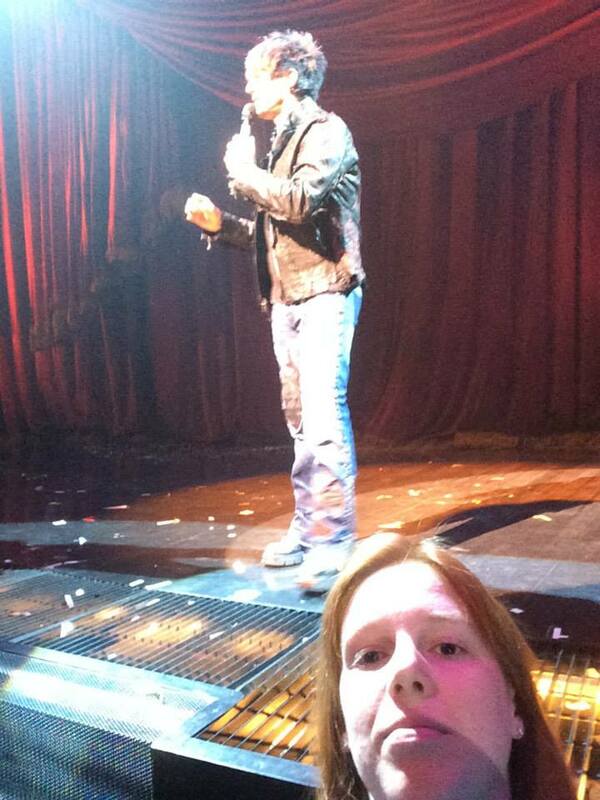 Criss Angel touched our hands, and he even took a selfie with Robin. I’m pretty sure she can die a happy woman now. Whether you BeLIEve or not, Criss Angel is a wicked talented performer who is a genuinely good guy and understands he’d be nothing without his fans. I still believe I saw him disappear off the stage and slice a woman in 2 half. This dude is for realz (intentional use of ‘z’). This had to be its own post for the pictures alone. Priceless. 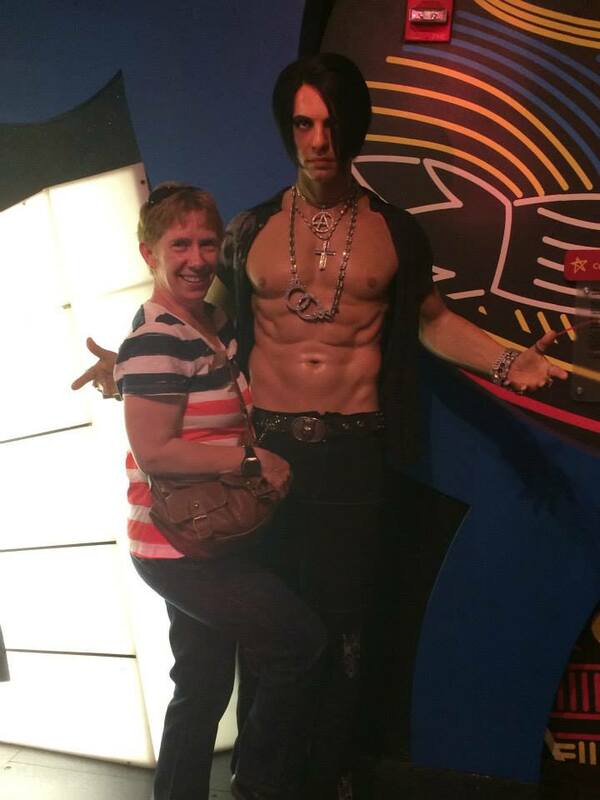 At Madame Tussaud’s Wax Museum, Robin got a little frisky with Criss Angel just hours before the show. At the end of the show, Criss let us take our phones out for some pictures. I managed to snap this terrible picture of myself. 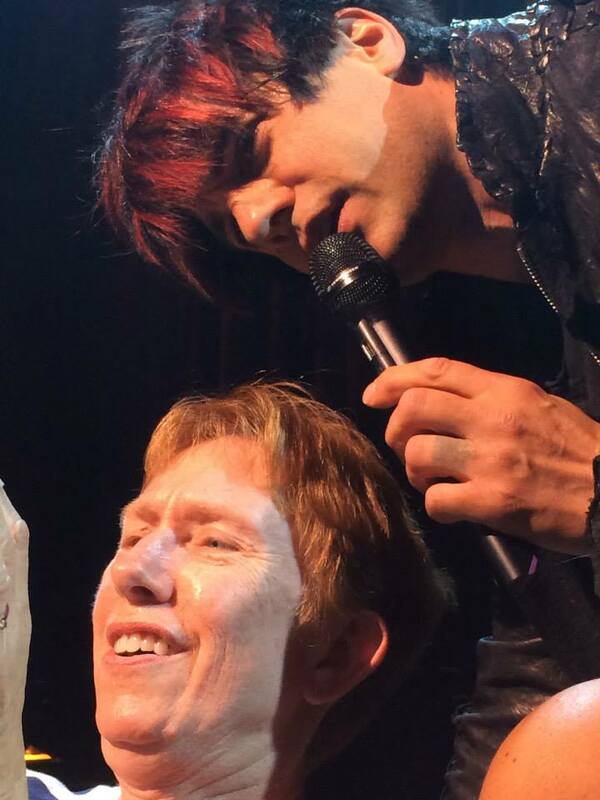 That’s Robin, my awesome mother-in-law taking a selfie with Criss Angel. The only selfie he took with anyone that night. Best. Night. Ever. I must warn you – this is just Part 1… Part 1 of many. Not too long ago, we came back from a whirlwind trip in the Southwest. Our original plan was to spend a week in Tucson, Arizona for the annual Handcrafted Soap & Cosmetics Guild conference. Knowing my parents love for travel and adventure, we invited them. Shortly after inviting my parents, we realized that Matt’s mom would be officially retired, so we invited Matt’s parents, Ron & Robin, along. They decided they didn’t want to go to Tucson and hang out while we were at a conference, but suggested hanging out in Las Vegas the week before the conference! And oh, while we’re at it… we might as well go to the Grand Canyon… it’s, like, right there! What was supposed to be a quick conference trip for Matt and me ended up being a 2 week family vacation in the desert southwest. It was AWESOME. We’re very lucky we like our respective in-laws so much and even luckier they like each other! 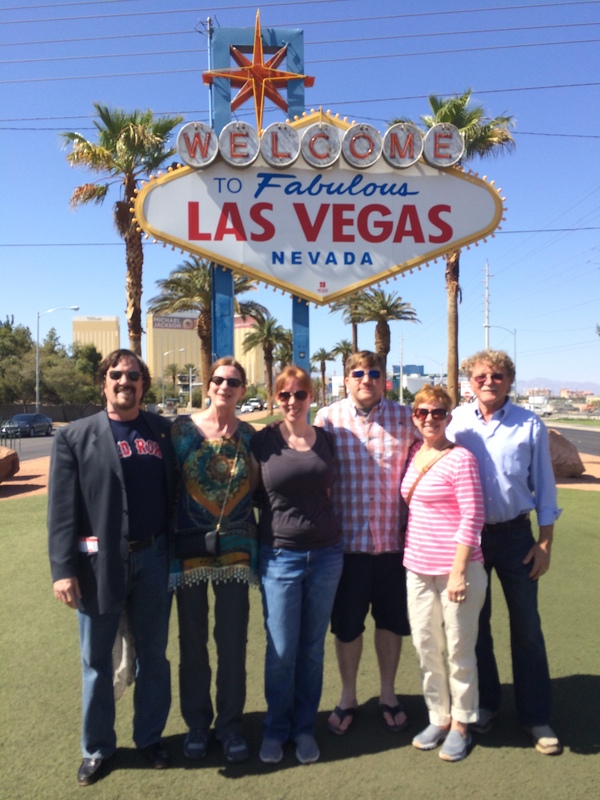 The four “grown-ups” (and I use that term very loosely) even went to see Jersey Boys together while in Las Vegas! We’ll be sharing a post about each destination with recommendations/reviews – just in case you decide to head that way. Put us on your reader app, because we’ve got nothing but goodness for you here!